"It's not as if that's all I do. I write poetry. I'm very much involved in charity work ... why single out that one thing?" Here is another of the four cartoons I submitted for exhibition at the 2009 Shrewsbury International Cartoon Festival. The festival takes place from April 23-26, though the exhibitions will open before that. The original version of this cartoon appeared in Private Eye in February 2005. 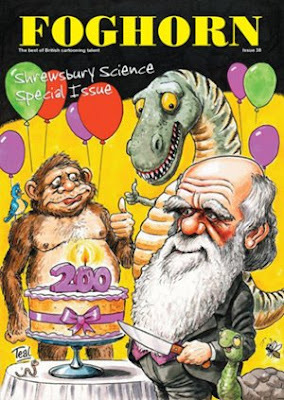 As the Shrewsbury organisers were looking for cartoons on the subject of science and nature, to tie in with this year's Charles Darwin theme, it seemed like an appropriate one to submit. As the original artwork sold shortly after it was published, I drew a new version and added watercolours. Usually I colour on-screen with Photoshop, so previous colour cartoons that I've exhibited at Shrewsbury have been signed prints, but I thought it'd be fun this year to break out the paints and submit only original artwork. Here's another one, which I put on the blog back in February. 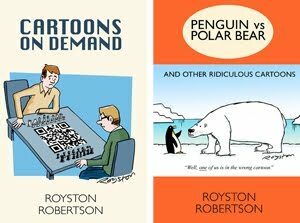 My cartoons were submitted for an exhibition now titled Boffination which is at the Bear Steps Gallery from Tuesday (April 14) and runs until after the festival has finished. 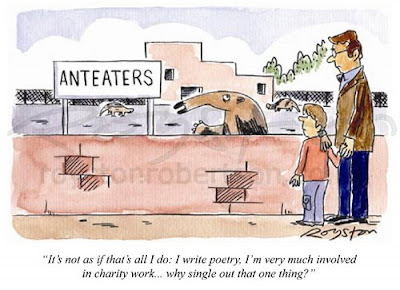 The anteater cartoon also appears in the new edition of Foghorn, above, the magazine that showcases the best of British cartoon talent and is published by the Professional Cartoonists' Association. You can read more about the new issue here. like the anteater gag. 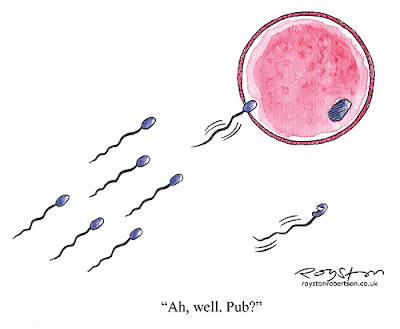 well, the sperm one's good too but i've seen that one recently. nice to see your watercolour stuff. Thanks, Will. It's nice to give the watercolours a go now and then ... but I do miss that "undo" function!